UMBRA - There is no shadow without light. UMBRA pendant in light grey crystal was designed by Studio Dechem for BOMMA. The mouth-blown lamp comes in a choice of two colors of metal "shadows", gold or blue. 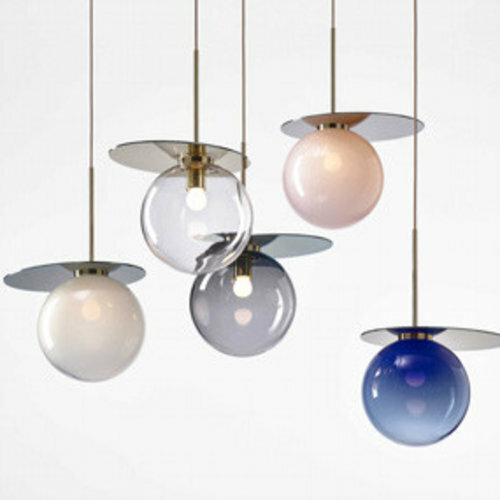 UMBRA pendant in blue crystal was designed by Studio Dechem for BOMMA. The mouth blown lamp comes in a choice of two colors of metal "shadows", gold or blue. UMBRA pendant in smoke crystal was designed by Studio Dechem for BOMMA. The mouth blown lamp comes in a choice of two colors of metal "shadows", gold or blue. UMBRA pendant in clear crystal was designed by Studio Dechem for BOMMA. The mouth-blown lamp comes in a choice of two colors of metal "shadows", gold or blue. UMBRA pendant in pink crystal was designed by Studio Dechem for BOMMA. The mouth blown lamp comes in a choice of two colors of metal "shadows", gold or blue. DECHEM studio was established in Prague in 2012 by Michaela Tomiskova and Jakub Jandourek. They first met at the Novy Bor School of Glass, where they both fell in love with the earliest synthesised material in human history. While Michaela went on to study product design at AAAD Prague (Academy of Arts Prague) and later worked for several acclaimed design studios, Jakub continued to hone his skills in the lighting industry, specialising in glass workmanship, technology, and manufacturing. Since establishing DECHEM studio they have focused on product design and maintained a special attention to glass.